Small leaf tea, specially selected and blended for Waitrose. 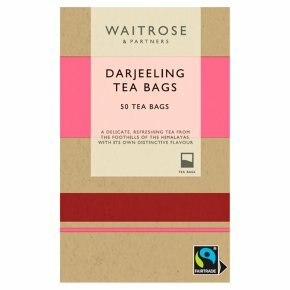 Tea from the Himalayan foothills, where the slow growth of the tea bushes results in the famous Darjeeling flavour: delicate and highly distinctive. On the back of the pack. How to make the perfect cup of tea. Warm the pot. Use one teabag per person. Use only fresh drawn water, do not reboil. Pour water onto the teabag as soon as it boils. Stir immediately. Leave for 3-5 minutes, depending upon prefered strength. Put milk into cup first, if taken.